Recently remodeled and updated! To included bathrooms with new fixtures, ceramic tile and granite countertops. Kitchen has new staineless steel appliances, cabinets and granite countertops. Well-appointed, furnished unit in excellent location and building. One block south of the Dunlawton bridge in Daytona Beach Shores (close to Ponce Inlet). Large (1990 square feet), direct oceanfront, sixth-floor unit with balcony from the living room and the luxurious master suite. Fantastic ocean and river views from this end unit. Building has an exercise facility with a sauna. Secured building with garage parking. Large formal dining area and large breakfast bar. TV in every bedroom. Exquisite decor and furnishings. This unit has it all. Full size washer and dryer in unit. Many golf courses nearby. Located approximately within one hour of Disney, the space center, and all major attractions. Restaurants located nearby. 7-11 across the street for your morning paper. 3 Full bathrooms. Remodeled with new granite counter tops and new fixtures. 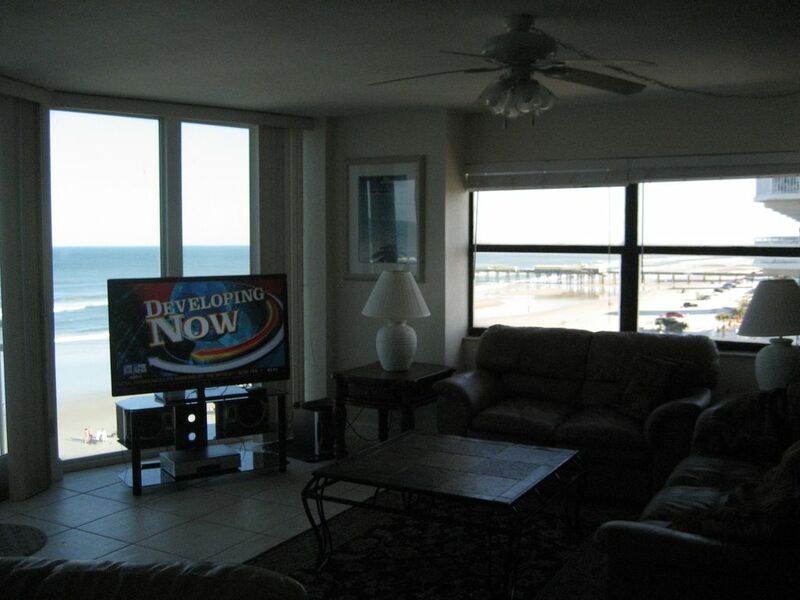 Take a quick ride down the elevator and you are on the gorgeous sandy beach of Daytona Beach! Views and sounds of the ocean are as close as walking out onto the balcony. There is nothing more relaxing than sitting on the balcony with your cup of coffee listening to the ocean. Complimentary WiFi available in the unit. New Stainless Steel Appliances to include full size refrigerator, stovetop, oven, dishwasher, microwave. Toaster and coffee pot. Just like at home! 3rd bedroom has tv that plays DVD's only. Balcony is on the ocean side with access from the Master Bedroom and the Living Room. Outdoor lounge chairs for your comfort. Beautiful well equipped beach front condo - building is clean and unit was fabulous - wish we could stay longer . Our family just spent a week at this condo and it was amazing! Easy access to everything, all the comforts of home with a very nice pool and ocean as your back yard. Could not have asked for a better place to spend my beach vacation this year!! Starting From $995/Week Special Events, Holidays NOT included in above rates. Call for special events, monthly rates and last minute specials. Plus 12.5% tax and a $115.00 cleaning fee.